Appointment at the step of Les Mouettes, rue Alphonse Jourdain. Embark on a visit like no other on the Tarn! 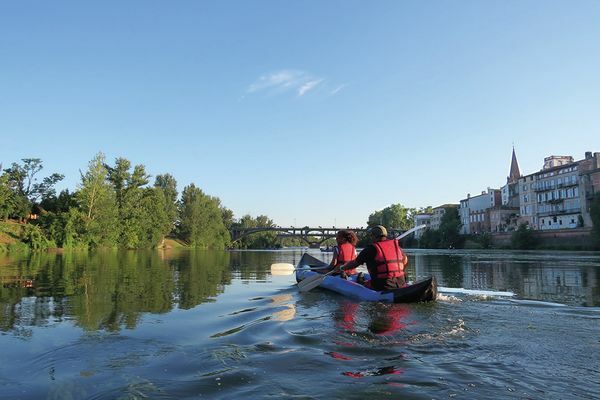 On board kayaks and canorafts, paddle between Sapiac and Albarèdes, go under the arches of the Old Bridge and admire Montauban over water: founding of the city, development of trade and textile industry, Brickworks, agriculture, floods, the guide-lecturer will tell you the links that unite the city to its river. Accessible route from 12 years old. Visit limited to 13 people. ON RESERVATION - Tourist Office 05 63 63 60 60 Tickets issued at the Tourist Office: 12 € / 8 € (rental of a kayak included). Provide a suit suitable for water (taps prohibited, swimsuit or bathing shorts, provide alternative business). It is imperative to know how to swim.